descendant of the Apostle Simon. Narjis (Arabic: نرجس‎ which means Narcissus) was reportedly the wife of Imam Hasan al-Askari (217–260 AH, c. 832 – c. 890 CE) and the mother of the final Imam of Twelver Shia Islam. Her name has been recorded as Narjis, Saiyra, Katrina, Lilliana, and Anna in books. more sources have described her as a "Roman (i.e. Byzantine) princess" who pretended to be a slave so that she might travel from her kingdom to Arabia. Mohammad Ali Amir-Moezzi, in Encyclopedia of Iranica, suggests that the last version is "undoubtedly legendary and hagiographic". According to Ibn Babawayh's account, Narjis saw Mary, the mother of Jesus, and Fatimah, the daughter of Muhammad, in her dreams and asked for her hand in marriage with Imam Al Askari. The first scholar to reveal information about Narjis as the mother of twelfth Imam was Al-Masudi. According to his account, she was a Roman princess named Narjis. Ibn Babawayh was the first scholar to discuss the nationality of Narjis on the authority of Muhammad b. Bahr al-Shaybani, who attributed his narration to Bishr b. Sulayman al-Nakhkhas. According to Ibn Babawayh and Allamah Majlesi in al-Ghaibah, she was a Christian Narjis was the granddaughter of a Roman Caesar who was a descendant of the Apostle Simon. Mohammad Ali Amir-Moezzi, in Encyclopedia of Iranica, suggests that the last version is "undoubtedly legendary and hagiographic". However, nowadays almost all twelvers consider her to be a Roman princess. Saiyra, Narges Khatoon, Katrina,Lilliana, and Magdalena are names attributed to her in the sources. According to the Sibt ibn al-Jawzi and Ibn Talhah, Sunni narrators, she had been known as Sawsan. According to Ibn Babawayh's account, Narjis saw Mary, the mother of Jesus, and Fatimah, the daughter of Muhammad, in her dreams on fourteen nights. They asked her to become Muslim and travel to Medina by masquerading as a captive of the Muslim army. According to al-Ghaibah, after conversion to Islam upon the request of Mary and Fatima, she had another dream in which she visited Hasan al-Askari, the eleventh Shia Imam. The Imam tells her that her grandfather will shortly send an army to fight against Muslims and that she should turn herself in as a captive without being identified. According to Donaldson, Ali al-Hadi, Hasan al-Askari's father, wrote a letter and handed it to his friend Bashar ibn Sulaiman with 220 dinars in a red pouch. He asked Bashar to go to Baghdad where slaves were sold to inquire of Amr ibn Yazid about a slave girl who would shout in the Roman Language (Greek) "Ακόμη και αν έχετε τον πλούτο και τη δόξα του Σολομώντα, του γιου του Δαβίδ, δεν θα απευθυνθώ σε σας. Έτσι μην σπαταλάτε τα χρήματά σας"! : "Even if you have the wealth and glory of Solomon, son of David, I will not turn to you. So don't waste your money!" Ali al-Hadi had predicted that the slave seller would respond that in any case he would have to sell the slave girl but she would respond: "Don't rush and let me select the buyer". Bashar narrates that as per Ali al-Hadi's request, he handed the letter to the slave girl. The girl read the letter and cried. Then she asks Amr ibn Yazid to sell her to the writer of the letter, "for if you refuse I will surely kill myself". Bashar narrates that on their way to Samarra, the girl kisses the letter frequently, rubbing it on her face and body. When Bashar asks her about the reason, she replies: "May the offspring of the Prophet dispel your doubts". After a while she reveals to Bashar her dreams and her escape from her father's palace. After joining Ali al-Hadi, he invites his sister, Hakimah Khātūn, and says to her about Narjis: "she is the wife of Hasan al-Askari and mother of Al-Qa'im. According to the views of scholars, especially Muhammad Khawja Bukhari in his book Fasl-ul-Khetab, Hamidah the daughter of Muhammad al-Jawad, the ninth Shia Imam, and the aunt of Hasan al-Askari, used to pray a lot to witness the son of Hasan al-Askari. On the eve of 14 Sha'ban in 255 AH she met Hasan al-Askari. When she decided to return, Hasan al-Askari asked her to stay with them in order to witness the birth of the child whom she wished so much to see. Hamidah narrates that when it was the dawn, Nargis felt a sudden twinge of pain. Hakima went to her. After a few moments, Narjis delivered the child. Hakima embraced the child and brought him to Hasan al-Askari. He took the child in his arms and he stroked his back and his eyes. Then he said aloud Adhan (call to prayer) in his right ear and Iqama (the second call to prayer) in his left ear. There were no signs of pregnancy and birth in Narjis. Hakimah Khatun has said that the "pregnancy of Narjis was like pregnancy of Moses and Jesus without any signs for the protection of the child". That is because the Abbasid decided to kill the expected child, who was known as the savior. After the birth of the child, Hasan al-Askari revealed the child to his forty close followers and then the child was hidden. According to Kohlberg, after the death of Hasan al-Askari, some Shia followers believed he was Qaem and Muhammad al-Mahdi was not his son because he did not have any child. Also, the group believed that he had not died and had gone into occultation. Another part of historians studying the pedigrees of some Central Asian "shejere" saints, believe that the 12th Imam was not the only son of Imam Hasan al-Askari. In the 11th Imam had two sons, Sayyid Muhammad (i.e. Imam Mahdi) and Sayyid Ali Akbar. One descendant of Sayyid Ali Akbar was Saint Ishan (Eshon) Imlo of Bukhara. Ishan Imlo - Bukhara "saint of the last time," as he is called in Bukhara, as it is believed that after him the Saints had no more. The average Asian Muslims revere him as the last of the Saints. Ishan Imlo. according to the source, died in 1162 AH (1748-1749), the mausoleum (Mazar) is in a cemetery in Bukhaara.The existence of any descendant of Imam Hasan al Askari is disputed by many people. However it is believed by Sunni and Shia followers of the Twelve Imams that Imam Hasan al-Askari had a son called Imam Muhammad al-Mahdi, who will be the redeemer of Islam. Genealogy trees of middle eastern families, mostly from Persia and Khorasan show that Imam Hasan al-Askari had also a second son called Sayyid Ali Akbar from Nargis. It definitely indicates that Imam al-Askari had children and it also substantiates the existence of Imam Muhammad al Mahdi. The reason, why the fact that Imam Al Askari had children or not is till today disputed was maybe because of the political conflicts between the followers of the Imamah and the leadership of the Abbasids and Ghulat Shiites who had not believe Hasan al-Askaris Imamah. Notable descendants of Sayyid Ali Akbar are Sufi Saints like Bahauddin Naqshband, descendant after 11 generations, Khwaja Khawand Mahmud known as Hazrat Ishaan, descendant after 18 generations and Sayyid ul Sadaat Sayyid Mir Jan, maternal descendant of Imam Hasan al Askari and Hazrat Ishaan. In her book "Pain and Grace: A Study of Two Mystical Writers of Eighteenth-Century Muslim India" p. 32, Dr.Annemarie Schimmel writes:"Khwaja Mir Dard`s family, like many nobles, from Bukhara; led their pedigree back to Baha'uddin Naqshband, after whom the Naqshbandi order is named, and who was a descendent, in the 11th generation of the 11th Shia imam al-Hasan al-Askari." Shiite historians generally reject the claim Hasan al-Askari fathered children other than Muhammad al-Mahdi ajtf., the Shiite hadith book Usul al-Kafi, in Bab Mawlid Abi Muhammad al-Hasan b. 'Ali confirms the Sufi claim that Hasan al-Askari had more than one wife, in addition to slave girls, with whom he had relations. In his Usul, al-Kafi writes, "When the caliph got news of Imam Hasan 'Askari's illness, he instructed his agents to keep a constant watch over the house of the Imam...he sent some of these midwives to examine the slave girls of the Imam to determine if they were pregnant. If a woman was found pregnant she was detained and imprisoned...". As mentioned by Ibn Babawayh, Narjis' death preceded the death of Hasan al-Askari in 260 AH, but according to al-Najashi, a Shia scholar, she remained alive afterwards and went into hiding with her son. Princess of Rome is an animated movie about Narjis, the mother of Muhammad al-Mahdi. The story holds that she was the granddaughter of the Roman Emperor and came to Samarra after many adventures to finally marry Hasan al-Askari. The movie has been directed by Hadi Mohamadian. Princess of Rome was screened at the 33rd Fajr International Film Festival on February 2015 in Tehran and received positive notes. ^ a b Sachedina, Abdulaziz (1981). Islamic Messianism. Albany, NY, USA: State University of New York Press. pp. 72–74, 78. ISBN 0-87395-458-0. ^ Algar, Hamid (18 October 2001). Imam Musa al-Kadhim. University of California, Berkeley, USA. ^ a b c d e Hussain, Jassim M. "The Occultation of the Twelfth Imam (A Historical Background)". Al-islam. Muhammadi Trust of Great Britain and Northern Ireland. ^ a b c d e Mohammed Raza Dungersi, Mohammed Raza (2012). 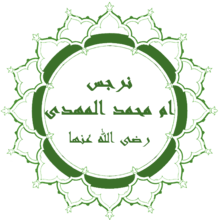 A Brief Biography of Imam Muhammad bin Hasan (a.s.): al-Mahdi. Bilal Muslim mission of Tanzania. 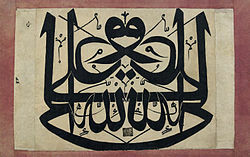 ^ a b c d Muhammad Baqir, Majlisi. "Kitab al-ghaibah" (PDF). islamicmobility. ^ Young, Robert E. (September 2008). The Sign of Your Coming?. Tate Publishing, LLC. ISBN 978-0615249858. ^ Staff writer. "Hasan al-Askari". cgie. ^ Donaldson, Dwight M. (1933). The Shi'ite Religion: A History of Islam in Persia and Irak. BURLEIGH PRESS. pp. 217–222. ^ a b Sadr, Sayyed Sadruddin. "AL-MAHDI" (PDF). .nabacultural. ^ a b Al-Shaykh al-Saduq. "Kamaaluddin wa Tamaamun Ni'ma" (PDF). duas. ^ "Archived copy". Archived from the original on 2016-10-22. Retrieved 2016-09-22. CS1 maint: Archived copy as title (link) ZiaIslamic "Gulzar auliya"
^ "Princess of Rome released". www.irna.ir. 5 November 2015. Retrieved 16 November 2015.